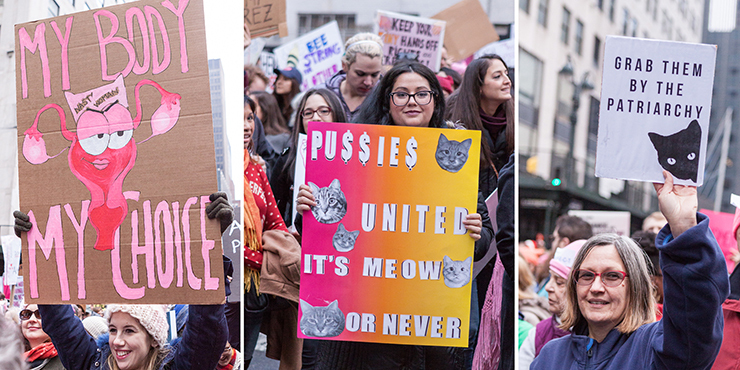 It was far more than 10 hours of pussyhats galore. The largest protest coalition in American history could well be emerging. 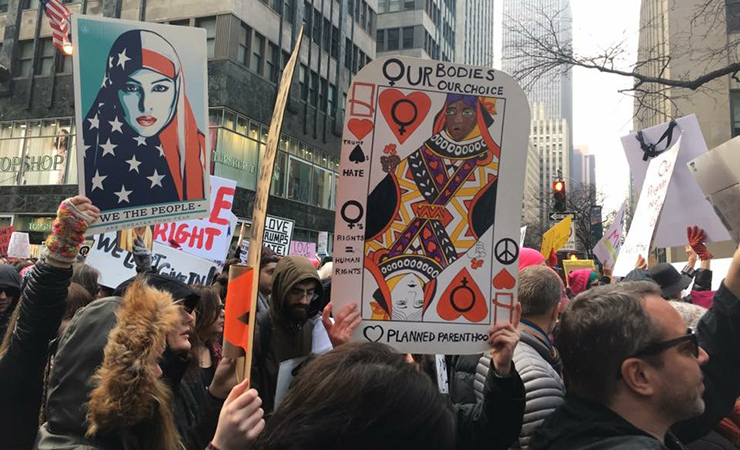 Here in New York, we’d seen it all—until, that is, the Women’s March descended on Midtown last Saturday, January 21, 2017, holding the city breathtakingly, earthshakingly captive for 10 straight hours. Coming the day after a presidential inauguration that left millions reeling in horror, this was our urgently needed riposte. No arrests. We were peaceable. The police were peaceable. But in true New York City-style, we were also insolent, snarky and jubilant. 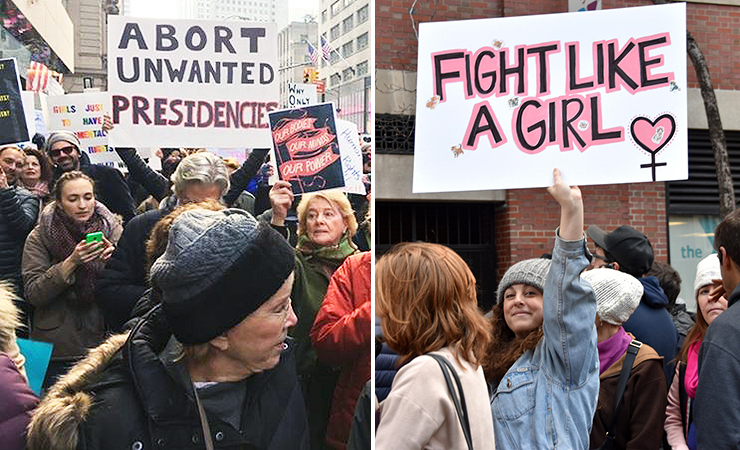 With the march intended as a heartfelt call to protect women’s rights in an administration vowing to dismantle them, disdain and contempt for the incoming president on his home turf overwhelmingly ruled the day. 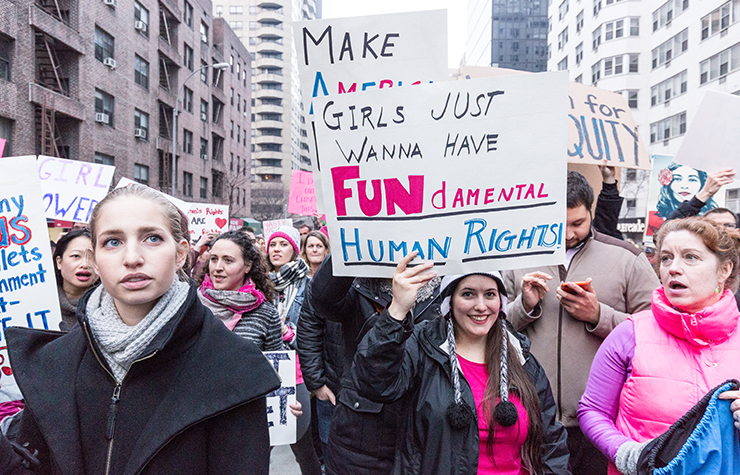 And amid the surging crowds of what is reported to be the largest protest event in American and possibly world history, taking place not just in New York City and Washington, but in 673 cities and towns on all seven continents, came the dawning recognition of a progressive, activist resistance movement joyously discovering itself. THIS IS WHAT HISTORY LOOKS LIKE, claimed one placard. THIS IS NOT A MOMENT, IT’S A MOVEMENT, announced another. Where it will go, we don’t yet know. But we can be sure it’s got legs. 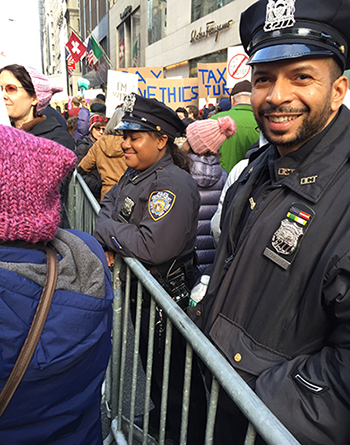 The New York City march was massive, with over 400,000 protestors packing the streets. It took this reporter 15 minutes to cross 42nd Street. One attendee asked a cop, Where’s the end of the march? His deadpan response: In the Bronx, maybe? 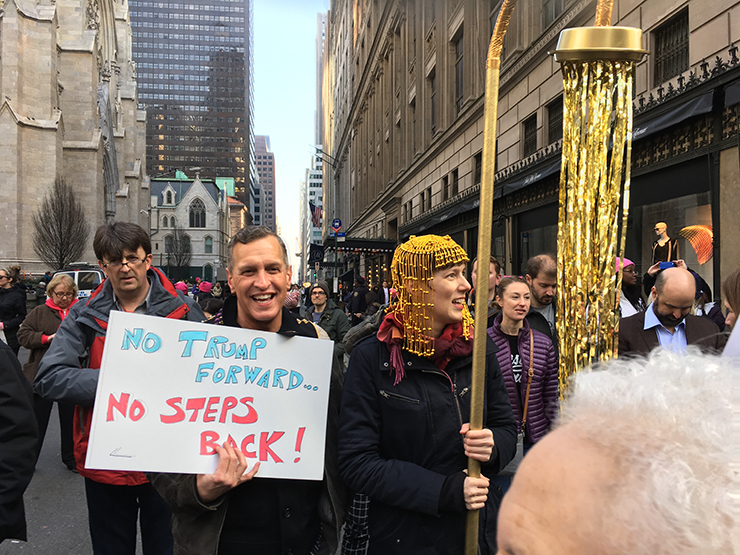 Actually, the march ended on Fifth Avenue one block below the heavily barricaded Trump Tower (a.k.a. the presidential weekend palace). So who showed up? The mix is telling. ’60s Vietnam War radicals (some with walkers and canes), Move On-ers, Black Lives Matter activists, LGBTers, artists, academics were there—dissidents and those on the sidelines. So were women of color and vocal over-fifty celebrities—Helen Mirren, Yoko Ono, Chirlane McCray, Rosie Perez, Cynthia Nixon, Whoppi Goldberg. NYCitywoman’s editor/publisher Barbara Lovenheim and art director Susan Huyser joined in, along with writer-contributors Georgetta Lordi Morque, Grace Lichtenstein, and this reporter. A fourth writer, Suzanne Charlé, covered the Washington march. And—welcome surprise—single and married men showed up in droves, often carrying children on their shoulders! Let’s admit it: Trump, or rather his lewdness, is uniting various swaths of women today, as perhaps nothing else could. Belatedly, alas, but better now than never. A trash collector on Lexington Avenue, ignoring the tumult around him, unloaded his garbage cans and departed with a shrug. A homeless man, also indifferent to the marchers, sat on the sidewalk in front of St. Thomas Episcopal Church, playing his saxophone. A determined photographer vainly tried to scramble up the ornamental grillwork around a Saks Fifth Avenue window. 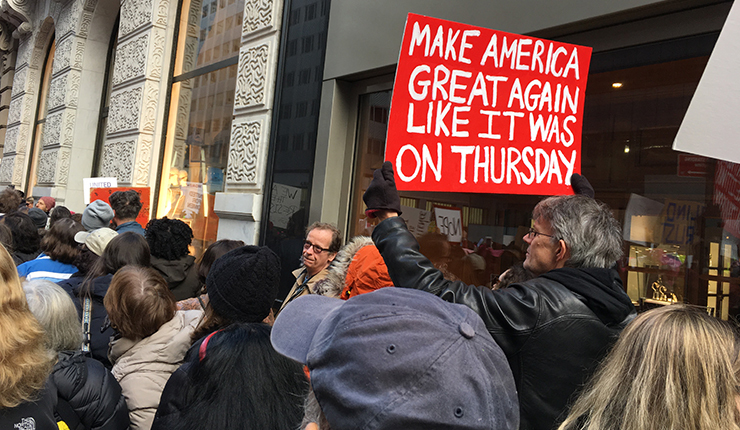 On West 55th Street, the designated exit route, a spontaneous, all-inclusive dance party erupted at the end of the afternoon. Most prevalent were the placards stating I’M WITH HER, arrows pointing in all directions. Indeed. Let’s be activists. Let’s be diligent. Let the coalition take shape and mold public policy.